Naming your house is a great way to define identity, add character, and show affection for that place we call home! Home brings to mind a distinctive vision, stirring memories, special smells, and a singular feeling of love. There’s no place like it, so doesn’t the house you call home deserve a beautiful appellation? For generations the women of my family have thought so! I grew up in a charming colonial named Cedar Knoll for the giant cedar tree in the front yard. I frequently played at my aunt’s little yellow house affectionately called Twin Oaks. My grandmother named every tract of land and house she ever owned from a swampy field up in the mountains called Beaver Run to the house my grandfather built her in the midst of the farm they worked for over 50 years called Hilltop Farm. It signals our ownership. It sets our expectations. It projects our persona out in to the world. It shows our affection and our reverence. It lends gravitas to four walls and a roof. The tradition of naming your house harkens back centuries before we used a numbering system and people once named their homes instead of streets to serve as an address. House names were historically based on location or the family name. Today, we are more familiar with grand estates, beach houses, farms, or historic houses and plantations having a name. But we don’t have to own a grand mansion to name our houses. We don’t have to own farms to name them either. I’m taking a cue from my grandmother and naming our house in Tennessee. It didn’t take long to arrive at our house name, and there really wasn’t any debate with S. either. The name just kind of came to me last spring when a certain tree, of which we have 14, was in bloom. Can you guess which one? 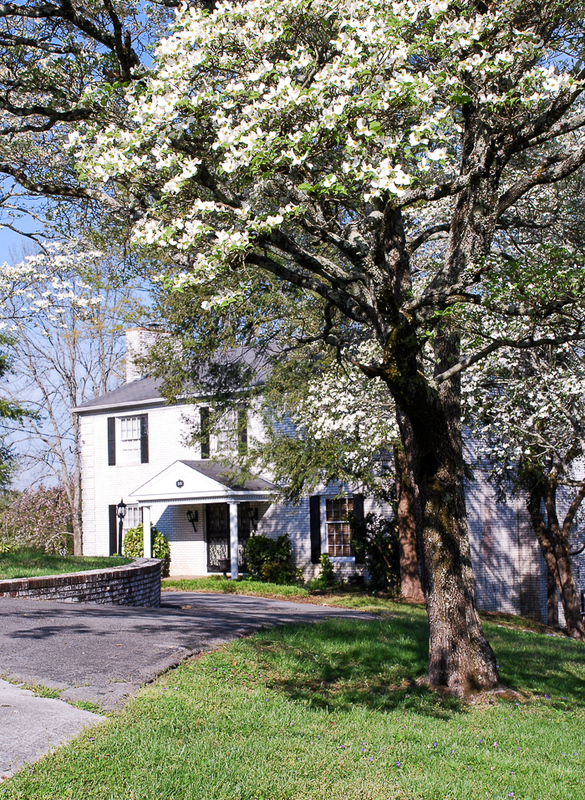 I love our dogwood trees, and the family that built the house in 1965 must have as well, since they planted so many of them. I like to think that the family who originally called this place home would approve. 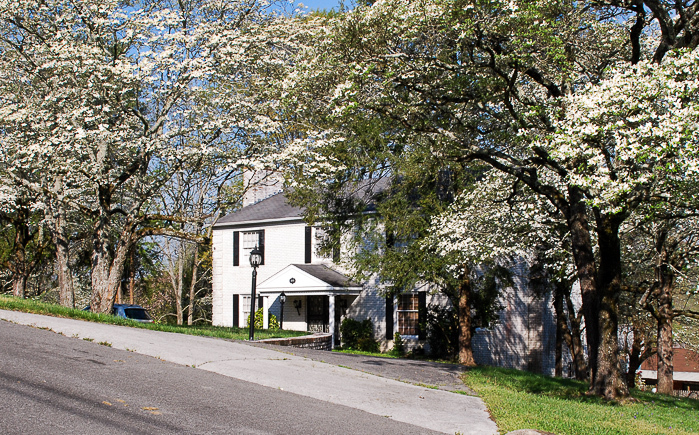 Dogwood House – how dignified that sounds, and yet having the word “dog” in it makes it a little flippant at the same time. Juxtapositions like this delight my heart and wit. The house is rather stately with its colonial revival symmetry, white brick, black shutters, and semi-circle drive, so the name fits rather well. As an aside…does anyone know why they are called dogwood trees? It is not enough though to simply name our house and then infrequently refer to it as such. That is not how the names of my family’s homes became inscribed on my memory and definition of home. I have to put up a sign and proclaim the name to the world just like the rest of my family! Well at least every passerby who bothers to look. House plaques can be rather expensive, but I found this great company Wheeler Custom Woods through Etsy to make my house sign very reasonably – only $39. The plaque is made out of color core plastic and the lettering is carved, so it looks like painted wood or metal. 1. Turn to nature – Look at the landscaping and natural elements that surround your house. Is there a particular feature like my dogwood trees that makes it distinctive? Do you love a particular flower that you’ve planted? Is there a natural landmark like a stream or cliff that would make a good name? 3. Fictional inspiration – Think about your favorite books, T.V. shows, and movies when naming your house. Is there a name from literature or film that resounds with you and your feelings about your house? 4. Family history – Reminisce about the important moments you’ve spent in your house. What memories have you made there? Is there a quirky story or special event that would make a good house name? 5. Architectural feature – Examine your house. Does it have a unique feature, a particular style, or type of architecture that stands out? What kind of dwelling is it? A cottage, a chateau, a lodge, or a farm? I would love to hear the name you pick out or what you already call your home! Comment below! Interested in seeing inside our house? 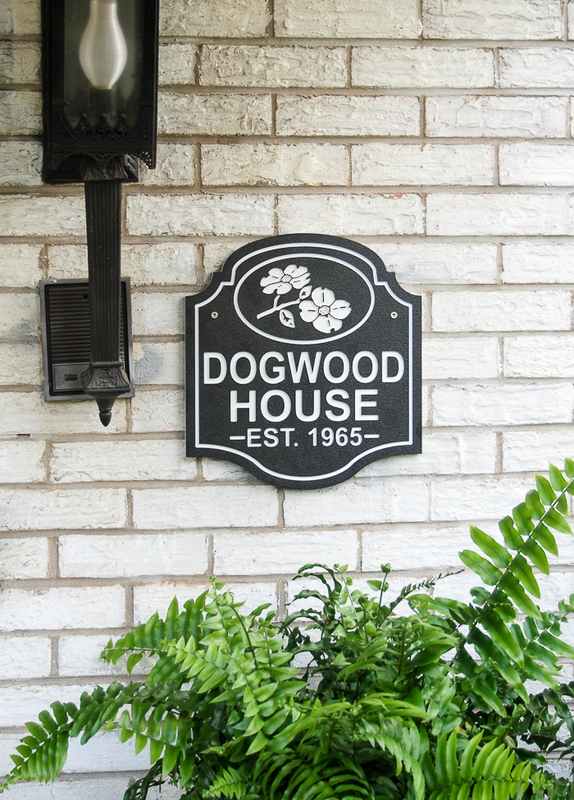 Follow along with our renovations to Dogwood House here! Oh that would be a lovely gift Cindy! Thanks for stopping by! Hello Katherine – I have just discovered your blog and plan to visit often. I enjoyed this post as I always wanted to name our little farm when I was a child (my parents thought that was too ostentatious). But now, after a lifetime of being transferred from place to place due to my husband’s job we have ended up with a house that came with a name! The Rookery. The house was built in 1917 for a lady named Mrs. Crowe and I guess that was the inspiration for the name. We do have a family of crows that live here and raise a brood every year. Fortunately I have enjoyed crows all my life.